Controlling II: Cost Reduction and Profitability – 18th, 19th of February 2019 – Bucharest. During this module, several real cost reduction examples will be presented to ensure the competitiveness of companies. Cursantii vor descoperi în cadrul cursului direcții inovative de abordare a sistemelor de costuri și bugetare prin care se garantează profitul țintă necesar anual și multianual. Attendees will discover during the training session innovative approaches to cost and budget systems that guarantee the necessary annual and multiannual target profit. 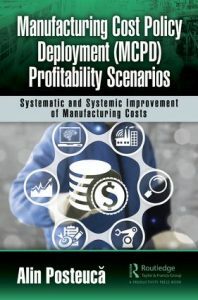 The training session includes exclusively the presentation of the Manufacturing Cost Policy Deployment (MCPD) System, which aims at reducing the annual unit costs by at least 6% per year for a minimum of 5 years, by identifying and reducing the losses and waste in the processes of each product family, losses presented in the forecasted and realized profit and loss account, without allocating significant resources for that purpose. This training is the only Controlling training program that has been running for 14 consecutive years in Romania.